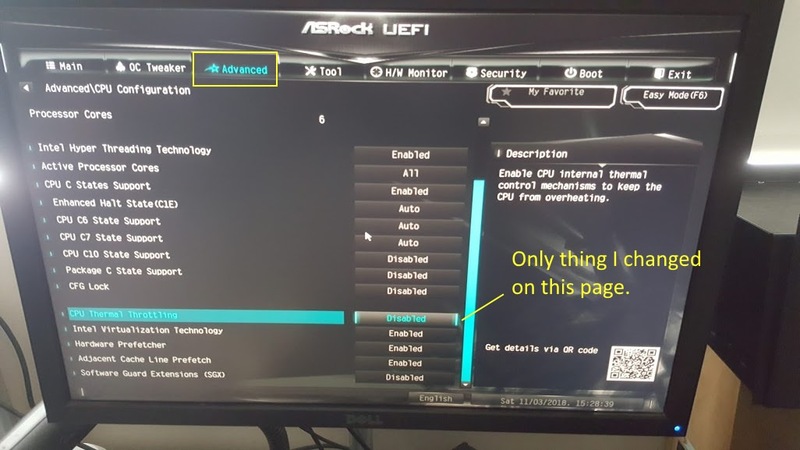 How to adjust fan speed, 3 pins, AsRock H370? Possible? Discussion in 'Overclocking & Hardware' started by AbRASiON, Oct 31, 2018. I swear, on the old system, the fan controller on the Sugo 08, allowed me to choose fast or slow mode and both worked. I've ended up with this problem now, hence the purchase of the fans. Cause it throttles itself down to 3.6/3.8 and the guys on reddit claim it's not power or heat doing it. It depends what you're doing if course, but the Turbo mode only goes that high on one core. If multiple cores are being used then you'd need to look at the 2-, 3-core etc. Turbo which will generally be lower. 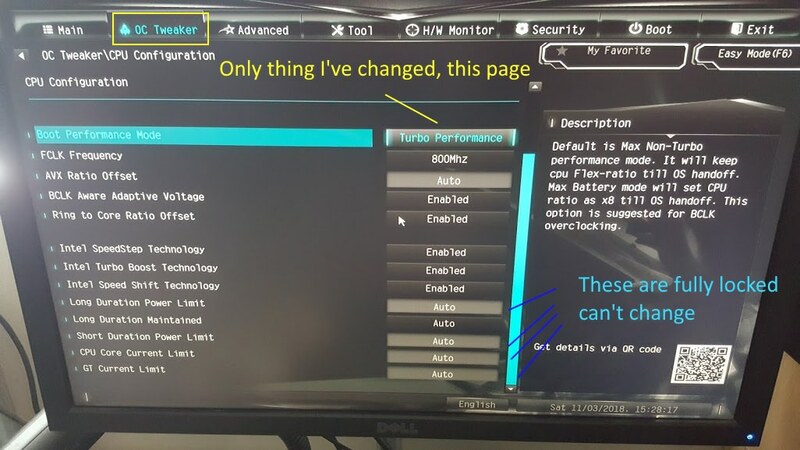 Not too many programs are going to force this kind of use, maybe a benchmark like IntelBurnTest and monitor the clocks with HWMonitor. Edit: you can make a K processor run at permanent Turbo on a H motherboard, but non-K CPUs you can't muck about with the clocks. Last time that was doable was Skylake with their Z170 boards (I did this with a 6500 and a non-official BIOS). Pretty sure 4.3 is the all core turbo speed? Some people cousi this is due to it being 65w? It throttles down nturallyn? According to the spec sheet, yes. Are you benchmarking when getting this result or using programs? 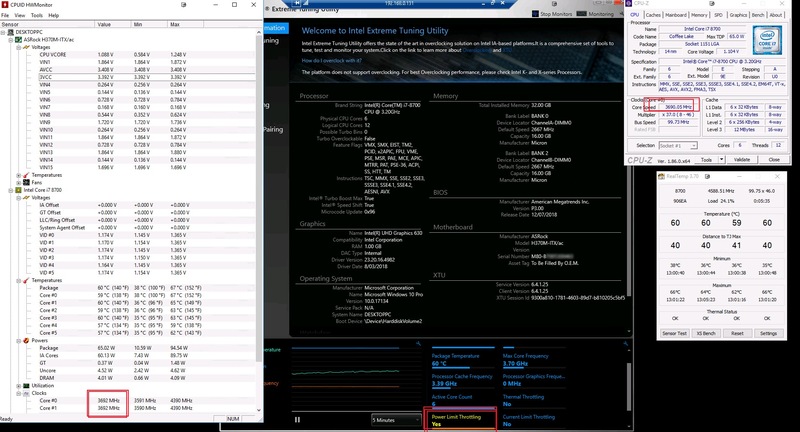 If you stress test 1 core, what's the most GHz you'll get? What temps are you recording? I've not used prime95 as a CPU stress tester (I've not used it in quite a while tbh). IntelBurnTest and AIDA always get my CPU to max out almost instantly, might be worth trying one of those to verify your result. I mean even prime95 is doing what I want (unfortunately) and that's stressing the CPU to points it's downclocking, sadly. I haven't seen a single 4.6ghz spike either, that kind of weirds me out? No cores have exceeded 4.6? Anyone else own this model?